This year was generally OK, with no real complaints in terms of the weather and growing season. I’ve taken a step back from the garden this year, as I had intended to move house. As it turns out we didn’t move, but still intend to move in 2014. Therefore little work happened and I largely left the garden alone other than tidying/clearing and moving a couple of plants. Some plants I will want to take with me when we move and I have plans to take some to my parent’s and plant them there where they can stay until I’m moved and settled in. Winter was mild, I had spring bulbs at around the usual time of year and then snows arrived and continued to come very late into spring. This of course had quite an impact on the garden, and there was quite a bit of damage, mainly to bulbs and early flowering plants that expected the weather to improve… but it didn’t. Subsequently I lost a lot of more sensitive plants such as Verbena Bonariensis and Lavender. A big loss was my mature Erysimum ‘Bowles Mauve’. Initially they were fine, as they are hardy plants and can take quite a lot of cold and snow before they succumb, eventually they were bent over and large sections of the plants were dead. I had to pull two out, leaving large gaps in the right border. So actually, it was handy too because I had the space to divide and move some plants around to allow my David Austin ‘Harlow Carr’ rose to breathe. Spring arrived a little late; after a ‘mild’ winter we were repeatedly hit by snow from February and into March. Finally Muscari bloomed for the first time, so to celebrate I took at many photos as possible as their blooms don’t last long enough. 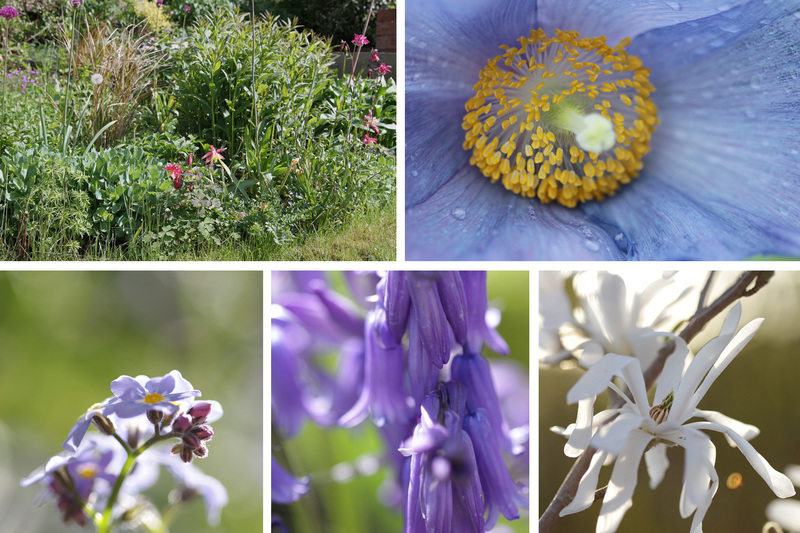 After a relatively late start to spring, by May there was plenty of fresh growth in the garden and most plants had caught up and were blooming on time – Bluebells and Forget-me-not for example. Summer had a nice mix of warm fine weather, but also some rain. Sometimes it was perhaps too dry, but I’m happy with the season. The garden did very well over summer and this year Ragwort had seeded all over the garden, which also meant we had many Cinnabar Moths all over! It was pretty amazing to be honest, and I hope to see more in future. It will be a shame if I don’t have them when I move, but I could always attract Ragwort and hopefully the Cinnabars will soon arrive. 2013 was definitely the year of the Geum, I’m generally a ‘cool’ plant person and have tried to broaden my spectrum – although I do have yellows and such if they are particularly attractive to insects – and the orange Geum ‘Totally Tangerine’ is pretty amazing, and is at its most spectacular when backlit during ‘golden hour’. October was a disappointment; a month which is often fine, sunny and sometimes even HOT was rainy. Very wet. I was unable to do anything in the garden with having heavy clay soil. So my plans to move plants to my parent’s didn’t happen. So I’ll have to try and find some other time, or wait until spring and plants are coming out of dormancy to move and divide them. I plan only to take things which I know I cannot be without or are expensive to replace – roses for example – but many such as geraniums are easy to divide so I only need small sections of the plants. I’m torn between the need to take my garden with me and the excitement of a clean slate. A new space, new ideas and new plants. I don’t want to get bogged down in what I have now. I know how much I’ve struggled over the past 5 years with the borders that were planted when I arrived. I just can’t see past what’s there. And yet in the house I have no problem with inspiration and seeing the potential of a coat of paint to transform a room. I really am not a garden designer; I just happen to like plants. The main plan is to take plants which will quickly fill spaces such as Geraniums; they’re always a good staple for any garden. 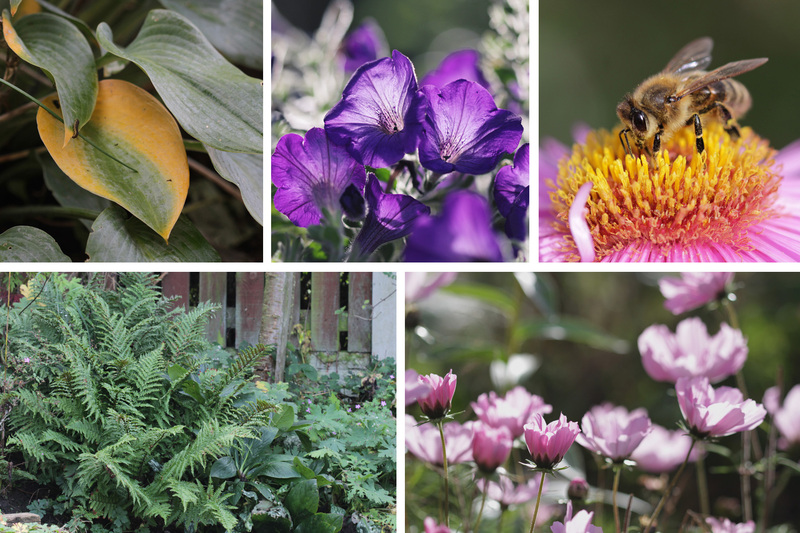 Then, I’ll probably rely heavily on annuals to fill gaps – and can use them in this garden to fill gaps where I’ve removed plants and taken them to my parent’s. One shrub, I know I can’t take with me will be the Russian Dwarf Almond, it’s too big for me to move and its branches are quite brittle and easily snap off. I’ll definitely replace it when I move, as it’s one thing I know I can’t be without. I will however be taking my species Sorbus, both are still small so will be easily moved. Your garden is so beautiful! 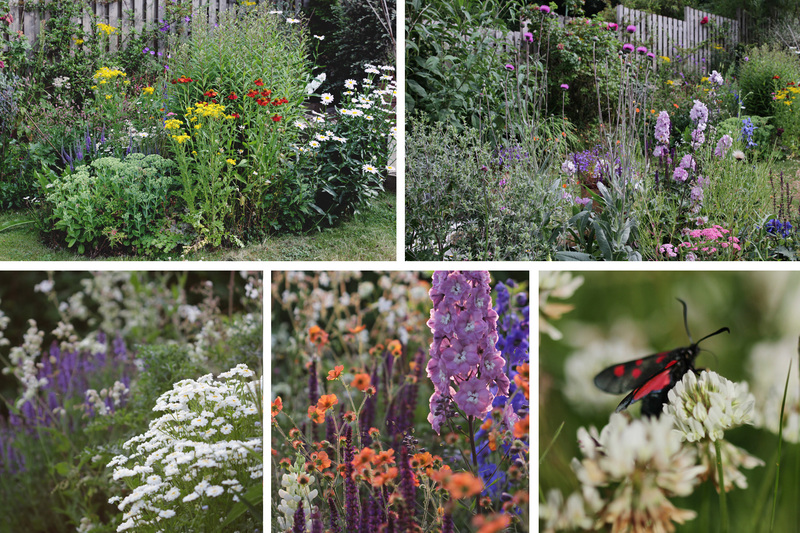 Which flower would you say is your best attracter for beneficial pollinators? I have been having to self-pollinate in my vegetable garden, so I am trying to find a plant that will increase the number of buzzing buddies in my neck of the woods! Thank you! Really you want a variety, this is because different species of bee, fly, hoverfly and other pollinators have different length tongues (proboscis). So one plant will attract certain species of Bee, when another attracts others if you see what I mean. So there is no one single plant, I’m afraid. Although a lot do love plants such as Aster, but they bloom late in the season so that’s no good for you right now. Many people with kitchen gardens ‘companion plant’ this is where you plant flowers or other veg together to distract pests and/or attract the good insects such as bees but also Ladybirds, Lacewings and Hoverflies whose young eat aphids – and Hoverflies will help pollenate. 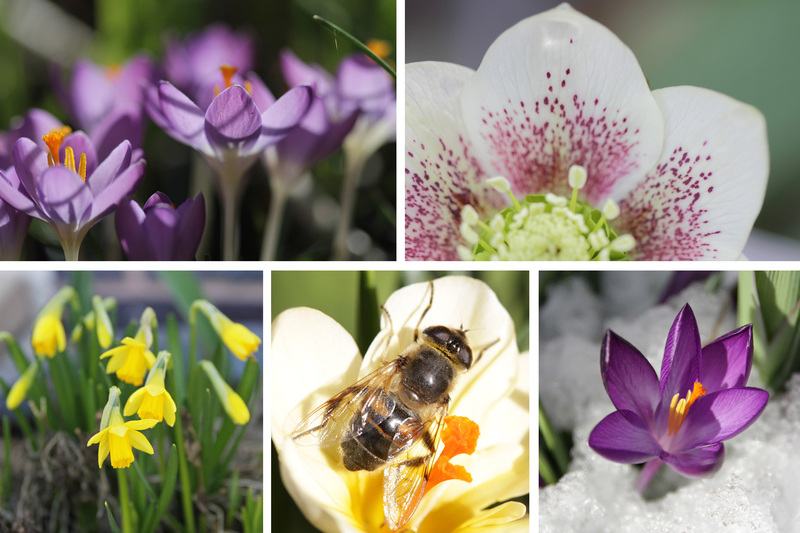 So I’d go with Lavender (again, blooms later), early spring blooms such as Crocus, Snowdrops and Mahonia are good for unusually warm weather that may wake Bees up too early when there’s nothing else around. I hear Californian Lilac are very attractive to Bees, but grow large so space is an issue. Many love Salvia, alternatively you could plant Sage which is basically Salvia too, rosemary too will attract a lot of insects if you allow it to bloom. Foxgloves and other natives such as Thistles, Onion blooms (Alliums), wild Garlic and Geraniums (including Herb Robert). Then, between plants you could sow poppies which look pretty and the insects love. To be honest, go for natives to your country/area. After all, the Bees have evolved with the plants and vice versa.